Posted 8 April, 2014 "Call for Public Input: Draft Proposal, Based on Initial Community Feedback, of the Principles and Mechanisms and the Process to Develop a Proposal to Transition NTIA's Stewardship of the IANA Functions." To ensure that the eventual proposal is community-driven and enjoys broad support, ICANN is committed to collecting and incorporating input and feedback from the global stakeholder community. Input and feedback can be sent at any time by self-subscribing here and posting on the ianatransition@icann.org mailing list. The archives are publicly available and will remain active after the list is closed. *This mailing list will remain open to allow discussions to continue. In addition, NTIA explicitly stated that it would not accept a proposal that replaces the NTIA role with a government-led or an inter-governmental organization solution. At the ICANN 49 Meeting in Singapore during the 24 March session, ICANN launched a multistakeholder-designed process to gather the community's views and contributions to address how the mechanisms for the transition of NTIA's stewardship of the IANA functions should occur. In addition to a public session open to the 1,940 participants physically in Singapore as well as remote participation for the session, a mailing list (ianatransition@icann.org) was created to facilitate further input, with an initial comment deadline of March 27th. Note: Comments received subsequent to 27 March are relevant to the dialogue and should be reviewed when reviewing the proposed draft process located here. 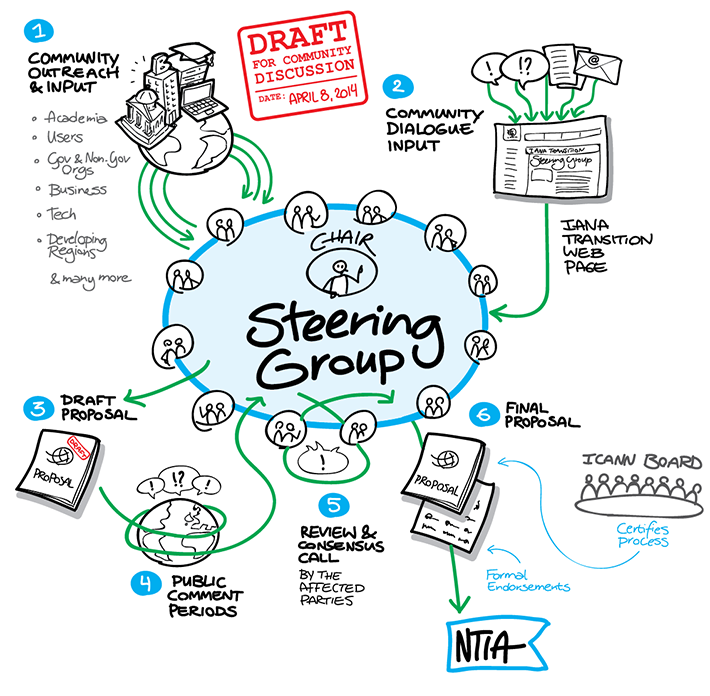 Based on that session and feedback received on the mailing list by 27 March, ICANN, filling the NTIA-requested role as convener of this process, now puts out for further feedback and input a draft proposal of the Principles, Mechanisms and Process to Develop a Proposal to Transition NTIA's Stewardship of the IANA functions. This draft proposal was also informed by the existing mechanisms and models familiar to the ICANN community and proven to be successful in terms of results (i.e. the ATRT and AoC processes) and consultation with the Internet technical organizations. Given that the various affected parties of IANA have somewhat different needs, there is value in keeping the distinct discussions running in parallel, and not forcing either full synchronization or exactly the same end result on them. This will ensure that the process completes sooner, and that the focus stays on the issues that are relevant to the particular parts of the IANA functions. Coordination however is needed. The discussions need to result in outcomes that are compatible, for particular issues (e.g. special use registries) we expect coordination essential for successful outcome. The discussions in Singapore and subsequent input have confirmed the need for a parallel but separate process to examine broader ICANN globalization and accountability mechanisms as the proposal is developed for the transition of NTIA's stewardship of the IANA functions: this document does not attempt to address those mechanisms. The consultation process on ICANN globalization and accountability, while highly interrelated with the transition from the USG, shall occur within the ICANN community. Building on discussions held in Singapore at the public session, this process is beginning (in parallel with the transition process) in a bottom-up manner. 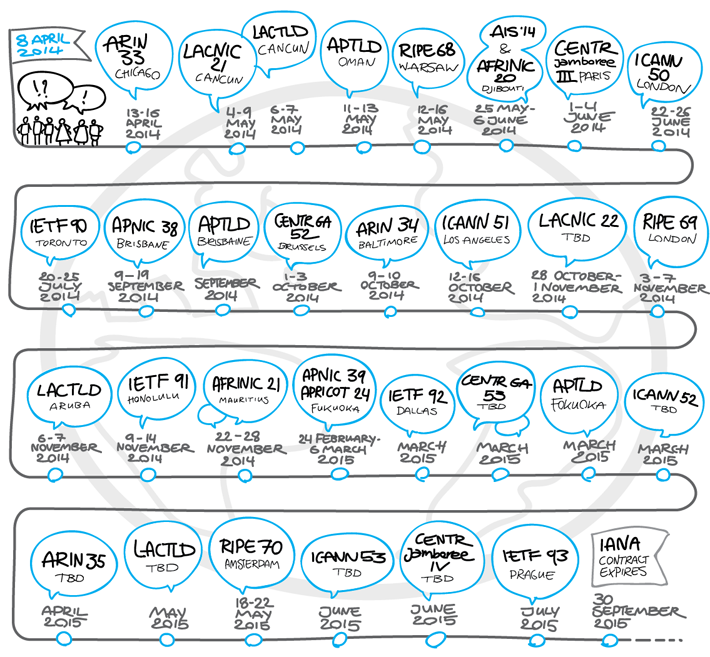 Based on feedback in the session (audio and transcript), the Public Forum session on 27 March 2014 (audio and transcript), and through the mailing list ianatransition@icann.org (email archives) received by the 27 March 2014 (midnight UTC) deadline, the following principles and mechanisms were suggested. At the IANA Stewardship Transition session at ICANN 49 in Singapore (24 March 2014), participants were also asked to provide input on the proposed process to use in the development of a proposal to transition the stewardship of the IANA functions to the global multistakeholder community. Discussion also occurred at the Public Forum session on 27 March 2014 (audio and transcript), and through the mailing list ianatransition@icann.org (email archives). Feedback from the community pointed to the value of establishing a working or steering group of volunteers to steward the process. Other proposed mechanisms to ensure transparency and accountability include employing use cases for testing the proposed models, and establishing clear and visible phases of activity. Other suggestions note that the process ought to conclude with the emergence of a community-driven proposal. Based on feedback described above and informed by successful community-developed processes and mechanisms, including the review processes set out in the Affirmation of Commitments (AoC), the following outline for the proposal development process is offered for comment. Form and operate a steering group to steward the process in an open, transparent, inclusive and accountable manner as described below. The community would form a steering group to shepherd the process. The steering group would be comprised of two representatives from each SO/AC group within the ICANN community, and two representatives from each of the affected parties (IETF, IAB, ISOC, NRO). Within the ICANN community, community members interested in serving need to submit a statement of interest. The Chair of the ICANN Board and Chair of the GAC will select the group members from this community similar to the approach used for AoC reviews. The affected parties will select their own representatives to the steering group. Care is taken by this selection process to ensure diversity and regional representation and to guard against any ICANN conflict of interest. The steering group would designate the steering group chair. As the convener of the process, the ICANN Board would appoint one participant as Board liaison to the steering group. The ICANN Board in overseeing ICANN's role as convener would: 1) ensure that the process executed adheres to the principles outlined by the community input and the NTIA principles outlined for this effort, and 2) ensure that the parameters of the scope document are upheld. Once a proposal is developed, the ICANN Board will not hold a vote on the proposal. The steering group's final proposal for submission to NTIA will be reviewed by ICANN and the affected parties in order for each party to provide their endorsement of the proposal. That endorsement will be communicated with the proposal, but there will not be a formal voting process. The steering group would be supported by an ICANN secretariat. All meetings and phone conference will be open for stakeholders to observe and relevant transcripts and recordings will be posted. 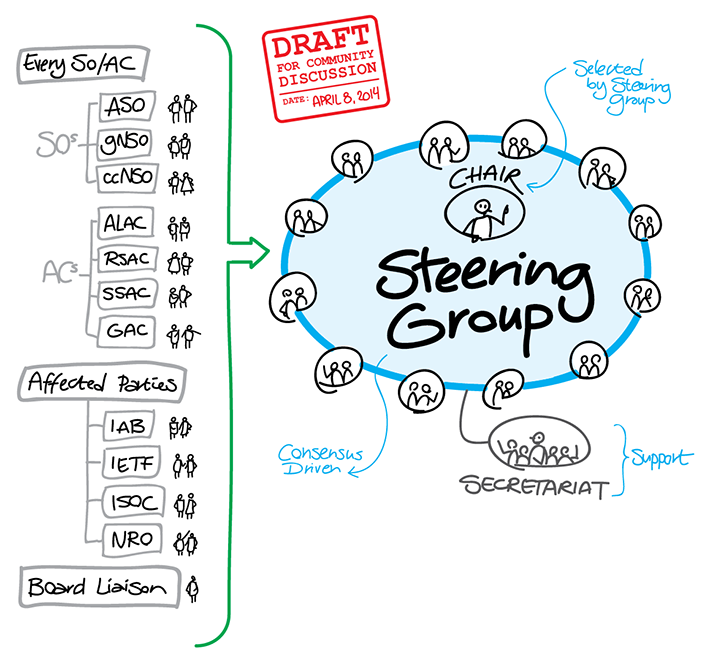 The steering group would be formed in time to convene for the first time as a group during ICANN 50 in London in June 2014. The steering group would hold an open forum meeting at London 50 to present itself to the community and hear additional input from the community. The steering group would have ongoing dialogues. This group would, in the London 50 timeframe, establish the steering group chair and finalize the group's charter, based on the inputs from the community, the scoping document and the principles set forth by NTIA. The steering group would also establish the process for development of the community-driven proposal. Adequate time should be afforded for proposal development processes conducted by affected parties and other interested parties, in order to appropriately provide the steering group all possible proposal elements on which it can deliberate. There should be appropriate community outreach and input as the proposal is drafted. The efforts to finalize the ultimate proposal to be delivered to ICANN for presentation to NTIA should be consensus-driven. If you have suggestions for a participation opportunity not listed here, please send them to ianatransition@icann.org. ICANN will also continue to hold public discussions, including at its upcoming ICANN Meetings in London (June 2014), Los Angeles (October 2014), and to be determined dates and locations in Africa, Latin America, and Europe in 2015. Engagement and outreach will also take place globally and in partnership among respective organizations. Visit ICANN.org for more information and resources; join our online public forums; send your thoughts to ianatransition@icann.org or read the archives; register for one of the many upcoming webinars; or follow us on our social channels (#IANAtransition)—be a part of the discussion! The Internet Assigned Numbers Authority (IANA) team is responsible for the operational aspects of coordinating the Internet's unique identifiers (the Domain Name System (DNS) Root, IP addressing, and other Internet protocol resources) and maintaining the trust of the community to provide these services in an unbiased, responsible and effective manner. Read Elise Gerich's (VP, IANA and Technical Operations) transcript (PDF, pages 8-9) introducing the IANA functions in the IANA Accountability Transition session ICANN 49 in Singapore (March 2014).